In cities in Europe, thousands have taken to the streets to demand more open entry for Syrian refugees. In Germany, crowds have turned out to cheer and welcome Syrian refugees arriving in their country. This is a very welcome development and different from the 1970s when the people turning out on the streets were more likely to be demanding tighter immigration controls and even repatriation of migrants from the Third World, including refugees. Don’t double the quota! – Open the Borders! 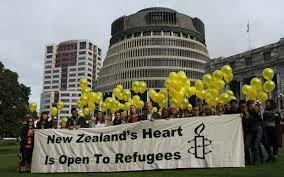 In New Zealand, rallies have demanded an increase in this country’s extraordinarily mean-spirited refugee intake of only 750 per year. There are petitions, already signed by thousands. Churches, schools and local communities have joined the call for the National-led government to increase the refugee intake; many people have offered to open their homes and churches to help house, feed and clothe refugees and refugee families. While Germany is open to taking in 800,000 refugees in a 12-month period, and is allocating 6 billion euros (the equivalent of nearly 11 billion NZ dollars). Germany has about 81 million people so its refugee intake for this 12-month period amounts to almost 1% of the country’s existing population. NZ has 4.5 million people so the extra ‘one off’ of 600 represents a meagre 0.013% of this country’s population. So NZ is taking in the equivalent of 1/76th of what Germany is doing. And it’s not like Angela Merkel is known for a kind, generous spirit! Moreover, NZ’s minuscule ‘contribution’ is even though the previous NZ government – Labour! – is partly responsible for the mess in the region, being part of the invasions of both Afghanistan and Iraq that wreaked havoc and led to the rise of ISIS. And what of the parliamentary ‘opposition’? Well, the Labour Party and Green Party called for a one-off special intake of 750 Syrian refugees this year and a permanent lift in the overall quota to 1000. 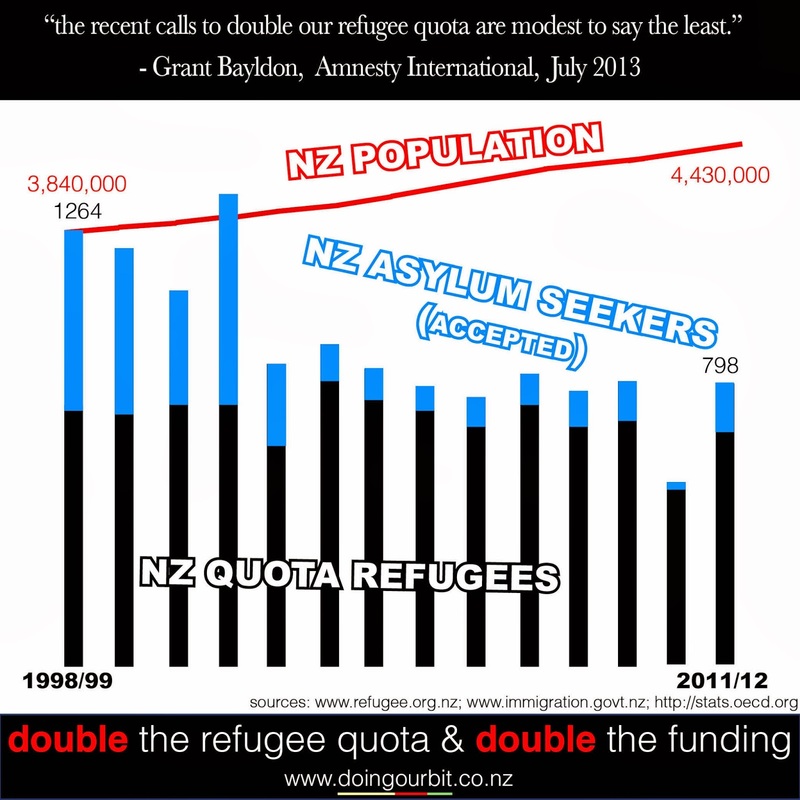 On August 31 Radio New Zealand reported, “Mr Little said the least the Government could do was lift its refugee quota from 750 people a year to 1000. How is that ‘leadership’, let alone ‘solidarity’, let alone an ‘alternative’? In fact, it shows how little difference there is between National and Labour. Labour can’t pose an alternative to National because it is precisely the same kind of middle-of-the-road capitalist party that National is. Moreover, Labour has a longstanding hostility to migrant workers – in fact, if anything, it is more hostile to immigration than National these days. Unlike Labour, which is totally cynical, the Greens are moved by a genuine liberal humanitarianism. However, if anything, they are even more hostile to immigration than Labour, let alone National. 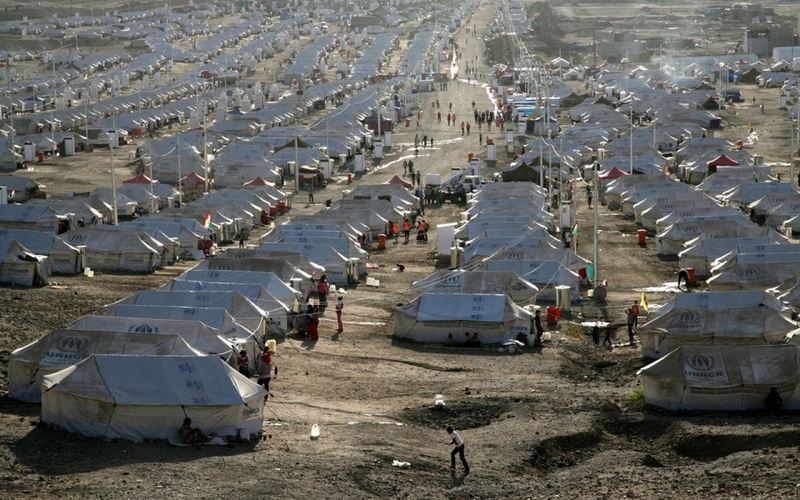 So their humanitarian impulses run up against their hostility to population growth and, especially, to immigration. The result is that their position is far more miserly than traditional Tories like Tony Abbott, David Cameron and Angela Merkel. What should the real left – ie the anti-capitalist and internationalist left – in this country be saying? The Syrian refugee crisis is having a big impact in this country and bringing out the best in most people, while also exposing the miserableness of the establishment politicians. In this (probably brief) period of political discussion and debate around border controls, we need to be making the case for open borders – and that means migrant workers as well as refugees. And, far from uniting with Labour and the Greens on the issue, we should be counterposing that open borders position – the only one that matches the material interests of the workers of the world – to their miserabilist ‘solutions’, ‘solutions’ dictated by the interests of NZ Capital Ltd.